eGovernment and autoritative public data in Denmark are still mainly focused on the landside of Danmark. But the need of eloborating the coordinating effort of administration at sea is recognised and the development of maritime eGovernment is happening within the next years. This paper discusses the data involved in this administration and focuses on the need for understanding the function and hence value of data. Some maritime data are dealing with accurate placements of objects, and as a tricky part some are dealing with floating placement. Other data are handling non-visible areas in terms of zoning, e.g. planning and interest areas and finally some data are representation of legislation, whether it is rights or restrictions. These different data are not always usable in the same manner. 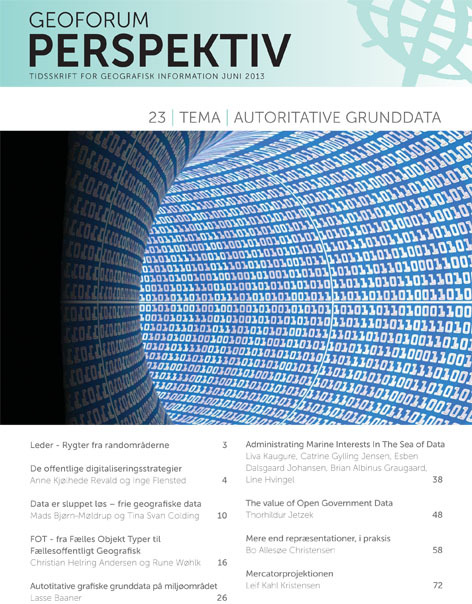 This paper investigates the correlation between spatial data and legislation. Experience from many years of land administration can be used as part of this discussion as well as the conclusions from this paper can be discussion as input to the ongoing development on land. Authors publishing on Geoforum Perspektiv retain full but non-exclusive rights in their articles, and are required to use the Creative Commons license cc-by 3.0 unported when submitting their work.